Underdog/challenger brands are some of the most interesting brands out there. These brands, more often than not, are brands which are a lot smaller than their competitor counterparts. As a result, they have fewer resources for their brand building. However, there is something very likable about these brands because of their authenticity and feisty “can do”attitudes. In fact, the mood is right for a lot of growth for these underdog brands. This underdog idea is not limited to the business world and can be seen everywhere from animated movies to sports figures. People like to support the ‘little guy’ who defies obstacles and has far-reaching goals. This seems to be a universal theme that people all over the world can relate to. Here is one point of view about underdog branding and Occupy Wall Street. 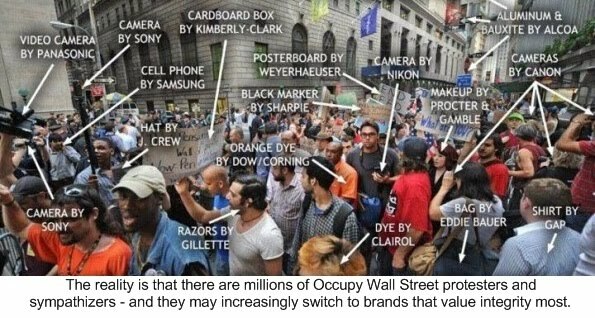 The Occupy Wall Street movement is the result of some deep-seeded anti-corporate sentiment that many consumer have. For the Occupy Wall Street protesters and sympathizers (which number in the millions of consumers in the USA, by the way), there is a perception of the unfairness of wealth and a lack of transparency of the wealth creation. As a result, their grass-roots movement has caught on. The movement, which takes a vocal stance against commercial giants and financial behemoths in favour of firms that advocate transparency, values and support a sustainable business purpose. Those involved with the movement (and sympathizers with the movement) are increasingly value-aligned with brands that emphasize honesty, integrity, and authenticity. These brands are more often than not, the smaller, underdog brands- they are the local coffee shops versus the coffee conglomerates; the credit unions versus the multinational banks. Especially in tough economic times, brands with these values will gain favor with consumers who are seeking an alternative to “profit at all expense, business as usual”. Millions of consumers with these values potentially mean millions in business to underdog brands. Brands are often a symbolic badge and provide confidence for consumers when they make their purchase decision. But sometimes a brand can be a facade; the brand reality of the product is can be very different than what the consumer expects- or is led to believe! The following narrative illustrates this point. Historically, the aerospace division of Rolls-Royce (which manufactures jet engines) was part of the same company as the auto brand by the same name. These two divisions split up and the car company that spiraled out was purchased by the British conglomerate Vickers. In 1998, Vickers put the Rolls-Royce automotive company up for sale and it attracted a bidding war between two German firms, Volkswagen and BMW, who were trying to expand their brand portfolios into the ultra-luxury market. Although BMW was the likely buyer (it had a longstanding supplier relationship with the company), Volkswagen ended up bidding close to £100 million more and won the auction. With the purchase of Rolls-Royce, Volkswagen received a well-past-its-prime aged factory where most of the assembly was done by hand. Rolls-Royce cars were still using a licensed 1938 Buick engine which was extremely inefficient as the company had not been able to afford an upgrade. After the deal had gone through, BMW came upon an interesting discovery. Rolls-Royce PLC, the aerospace division and an independently listed company, was the owner of the Rolls-Royce brand name and logo. BMW jumped on this opportunity and purchased the naming rights for cars at a bargain price of £40 million (much less than Volkswagen originally paid for the car company). BMW started fresh and built a brand new factory with state-of-the-art equipment, hired a designer to recreate the vintage look of Rolls-Royce cars, and gave the new vehicles an efficient BMW-made engine. BMW is now the sole legal manufacturer of Rolls-Royce cars and Volkswagen is stuck with an old factory capable of producing old, "unbranded" cars. What this story highlights is the fact that from a consumer’s vantage point it is not always easy to see what stands behind a brand name. Most consumers likely have associations to Rolls-Royce that include legacy, timelessness, and elegance. Many may be startled and even upset to learn that Rolls-Royce, by most measures, is a new car company created by BMW. The only thing linking the Rolls-Royce cars of today and those of the early 20th Century is a trademark to the naming rights. With this example in mind, it is perhaps necessary for consumers to view brands in a different, albeit more jaded, light. Although brands can be useful as a symbol of brand values and legacy, they can also act as a facade intentionally set up by a parent company in order to exploit and leverage brand equity. Across the world there has been a proliferation of street guerrilla marketing. In Santiago Chile wall after wall is covered in colourful graffiti. Unitas advertising agency used this in their new promotion of Faber-Castell pencil crayons. Walls covered in graffiti appear to be peeled back to uncover a line of colourful pencils laying in a row. In Copenhagen, Denmark the Bates Y&R agency performed a stint for the 4x4 Jeep. 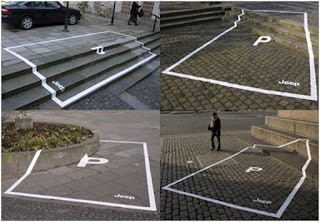 They traced out parking spots in unconventional parts of the city to display that Jeeps really are off-road vehicles. This trend goes further than companies; even government entities have employed this marketing tactic. 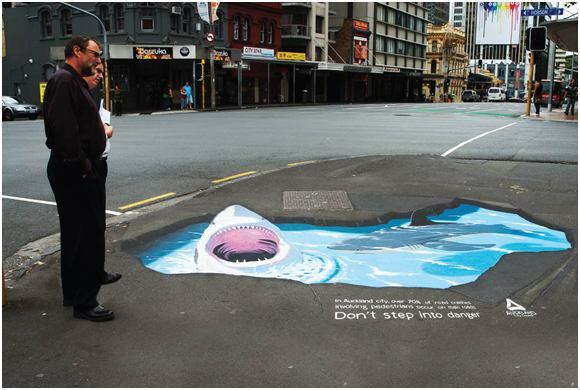 In Auckland, New Zealand street chalk was placed specifically to encourage pedestrians to make safe choices on main roads, while promoting the number of road crashes that involve pedestrians. The picture of shark-infested waters was created on the ground with the captioning “Don’t Step Into Danger. In Auckland city over 70% of road crashes involving pedestrians occur on main roads.” with the Auckland City Council logo painted beside it. These forms of marketing, although different, share similar characteristics and purpose. Part of their effectiveness stems from their unexpected presentation. Each ad appears in targeted areas of the city, but on "media" where you do not expect to see advertisements: the ground, city walls, and places used by street artists. Some street art has gotten very popular too. For example, the popularity of some street art has attracted international attention (e.g. Bansky's work). His work and the work of other street artists have yet to be completely commercialized by the re-selling of prints. Street Art is innately cool. It is exciting, it breaks conventions and it breaks the rules. 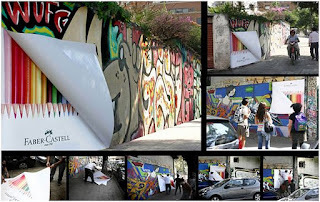 By appearing as street art, Guerrilla street marketing automatically becomes attention grabbing and absorbs all the excitement and edginess that its non-commercialized counter-part is endowed with. It is easy to understand why marketing and advertising firms would then want to take advantage of this new method of contact with their consumers. Textbook after journal after newspaper has repeated how congested the marketing world has become, and how consumers are subjected to thousands of advertisements on a daily basis. The problem has always been “how do we grab their attention now,” and street guerrilla marketing has started to become the answer. Not only is it attention grabbing, it stimulates discussion, people talk about “that cool thing they saw on their walk to work.” They share it with their friends, they take pictures of it, thus creating this exponential force that reaches a greater amount of eyes and ears than just the people that walk by it. Marketing firms have a great advantage as it can be difficult at times to decipher whether a piece is authentic street art or a marketing ploy. Guerrilla street marketing has yet to hit its peak, it has not yet been overused and abused. In the next couple of years this method of marketing will become more prevalent as it is a short-term solution for stealthily grabbing consumers’ attention.